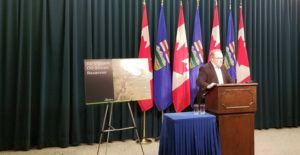 On Tuesday, the Government of Alberta announced that the Sprinkbank landowners, the Robinson family, had agreed to sell the land required for the Springbank Off-Stream Reservoir Project (SR1). The land purchase amounts to 188 hectares (465 acres) and, with this latest acquisition, the province has now purchased 20 percent of the total 1,566 hectares (3,870 acres) of land required for the project. This is a promising development, particularly considering Ryan Robinson, the land sale signatory, was one of the original founders of the SR1 opposition group Don’t Damn Springbank. We are now one step closer to securing the flood protection Calgary and downstream communities desperately need, and for that, we are very grateful to the Robinson family and their contribution. We do not doubt that this was a difficult decision for them. Additionally, we must recognize all the hard work on the part of Transportation Minister Brian Mason and his team within the NDP government in moving this critical project forward. But… it’s far from over. There is still land needed, opposition groups, and regulatory hurdles to clear. Significant work and resources have gone into bringing the project this far, we cannot afford for it to fail now. Find out what we’re doing and how you can help: Flood Coalition. For more information on the land purchase, read the full media release from the Province here.